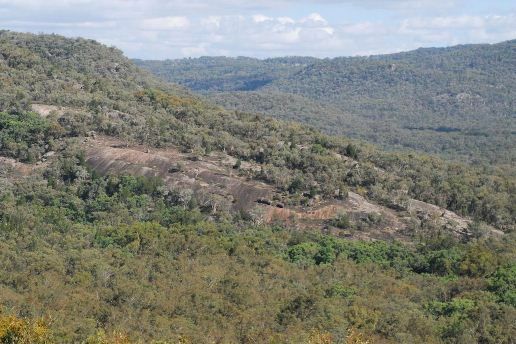 Rockview is a 1,957 hectare wilderness property near Inverell in northern NSW. It supports significant areas of old growth forest, including nationally threatened Box-Gum Grassy Woodland. South Endeavour Trust purchased the property in 2009 to protect it from encroaching agricultural development and to ensure proper control of feral animals that threatened its ecological values. Rockview is home to 418 native plant species, 12 vegetation communities and 130 bird species. It has a spectacular landscape, with dramatic exposed granite rock shelves and slopes and large balanced tors. Extensive areas of Box-Gum Grassy Woodlands which are recognized as an endangered ecological community under the NSW Threatened Species Conservation Act 1995 and federal Environmental Protection Biodiversity Conservation Act 1999. The location of the Conservation Area within a Regional Habitat Corridor and an area identified as a priority for conservation.